Conrad is an interesting character and Renschman is a character you will love to hate. Although I would really like to know more about why he is so bent on destroying Karen. It seems like there is more than just wanting her father’s business. But having said that, I’m sure the sequel will go more into that. I believe many readers will enjoy the uniqueness to this story and I recommend this to young adults and anyone who likes a thriller with an alternate history twist. 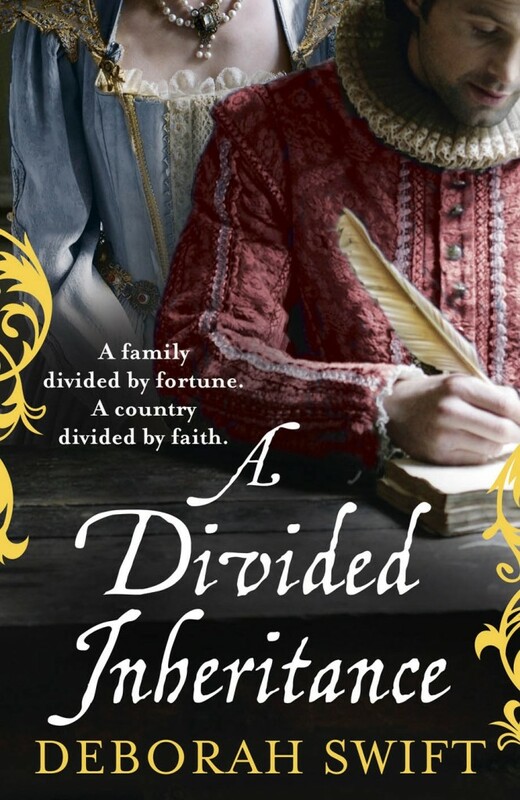 I would like to introduce Author Alison Morton. 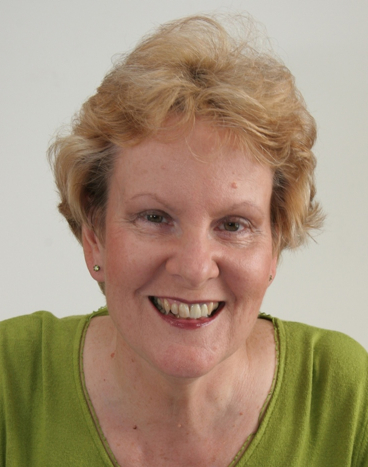 Alison grew up in Tunbridge Wells, a former spa town in South East England, and worked in the City of London, dealt in coins and antique jewellery, head-hunted chief executives, served as a reserve military officer and owned a translation company. She completed a bachelor’s degree in French, German and Economics and several years later a masters’ in history. She now lives in France with her husband. Three months later, she had completed the first draft of INCEPTIO, the first in her series of Roma Nova thrillers. INCEPTIO was shortlisted for the 2013 International Rubery Book Award and awarded a B.R.A.G. MedallionTM in September 2013. 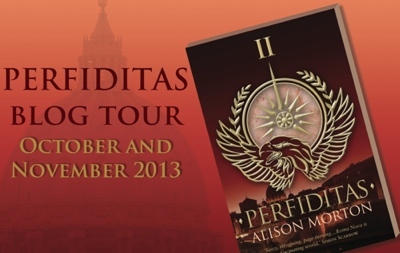 The next in the series, PERFIDITAS, was published October 2013. Alison is working on the third book SUCCESSIO. Stepping into a book’s world is always the start of an exciting adventure, especially going back to the past to hear the clash and smash of an ancient Roman battle, admire the frocks and pelisses of Jane Austen’s Bath or even smell the stench of Victorian slums. But what if that past is an “alternate” one where history developed differently? What if King Harold had won the Battle of Hastings in 1066? Or George Washington had failed to cross the Delaware River on Christmas night in 1776? If Boudicca had won the Battle of Watling Street and thrown the Romans out of Britain? Or that firm favourite, if Hitler had won the Second World War? More intriguing is when something that seems obscure at the time turns out to have a massive impact, e.g. the thought not occurring to Tim Berners-Lee to link up hypertext and the embryonic Internet to ease CERN scientists’ daily working lives to produce the world wide web, or, even more simply, if hadn’t rained the night before Agincourt. A story can take place can take place in the past, present or future, but the point of divergence (POD) from the standard timeline must be in the past. The diverted timeline can’t be changed back by a time machine, technical gizmo or waking up and finding it’s all been a dream, or possibly a nightmare! And lastly, the narrative should show some of the consequences of the change and describe how the alternate world works. 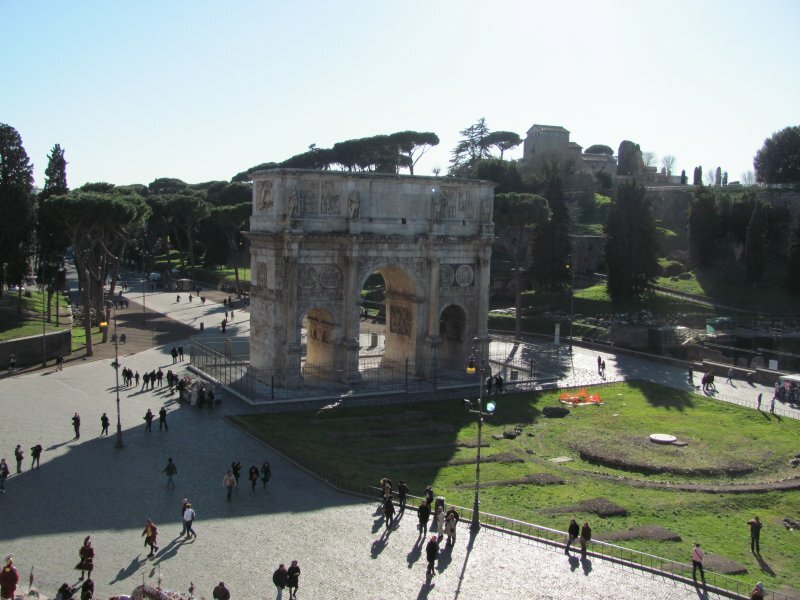 In my Roma Nova thrillers, the trigger in the past was the final brutal suppression of paganism by Christian Roman emperor Theodosius in 395 AD that sent four hundred non-Christian Romans north to find a safe place to live. Over the following sixteen centuries, the late fourth century colony battled its way through history to become Roma Nova, a high tech, financial mini-state that retained and developed Roman values, but with a twist. And Roma Nova’s very existence has altered the rest of the world’s history. Reaching into the past means getting inside the heads of the characters, imagining what they see in their everyday world, what they smell, eat and touch. 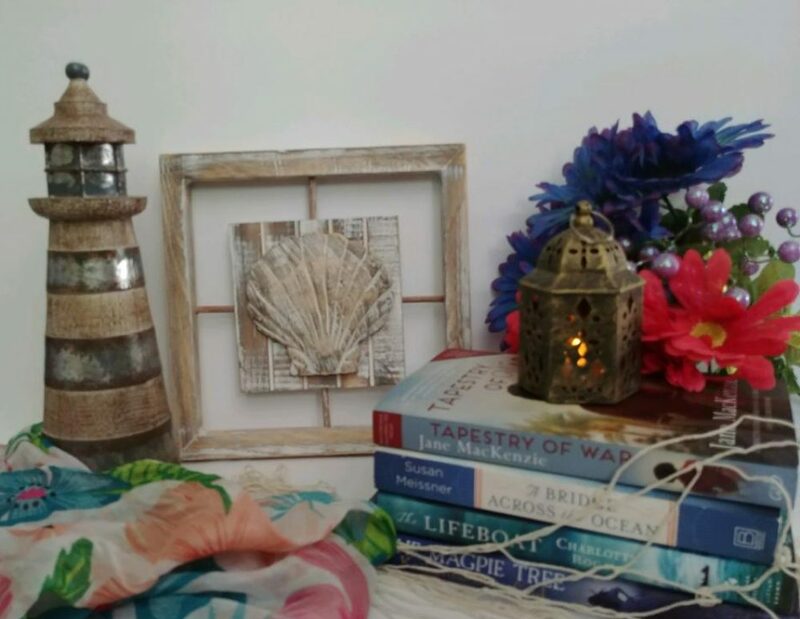 For stories set in a different country, writers can visit the places the characters would live in, smell the sea, touch the plants, walk under the hot blue sky, or freeze in a biting wind. But if a writer invents that country, then the task is doubled; no sources and no research visits. Not only history, but geography and social, economic and political development must be worked out carefully; this sounds dry, but every living person is a product of their local conditions. And to keep the story plausible, it must develop in a historically logical way. I firmly believe you have to know your history before you can attempt “alternating” it! As with all history-based fiction, research must be worn lightly and not dumped on the reader. One way to stay plausible and keep the reader engaged is to infuse, but not flood, the story with detail that reinforces the original setting the writer has introduced. 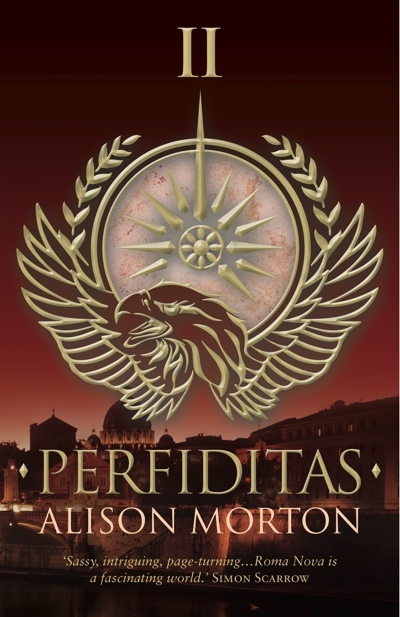 Even though INCEPTIO and PERFIDITAS are set in the 21st century, the Roman characters still say things like ‘I wouldn’t be in your sandals (not shoes) when he finds out.’ And there are honey-coated cookies (honey was big in the ancient Roman world), not bagels, in the police squad room. Ultimately, alternate history allows your imagination to explore outside the confines of the set timeline and to introduce conflict and challenges to history in your own terms. And that’s a lot of fun! 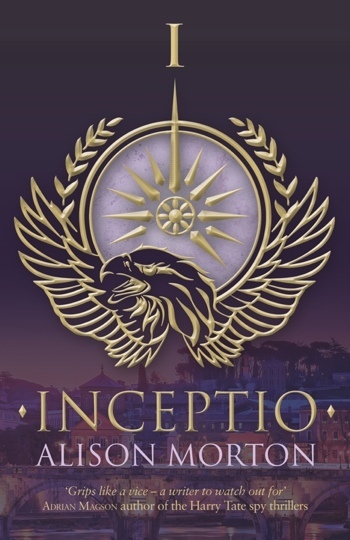 INCEPTIO is available as a paperback and ebook here and PERFIDITAS as paperback and ebook here. Also through your local bookstore as a paperback and from other online retailers. Arthur Russell is a native of County Meath, Ireland. He is a professional in Agro-Industry and has worked in Ireland, Eastern Europe and Central Asia. He is currently on assignment in Mongolia. When he is not on assignment abroad, he lives with his wife Mary, in Navan, Co Meath. He has 4 adult children and 3 grand-children. 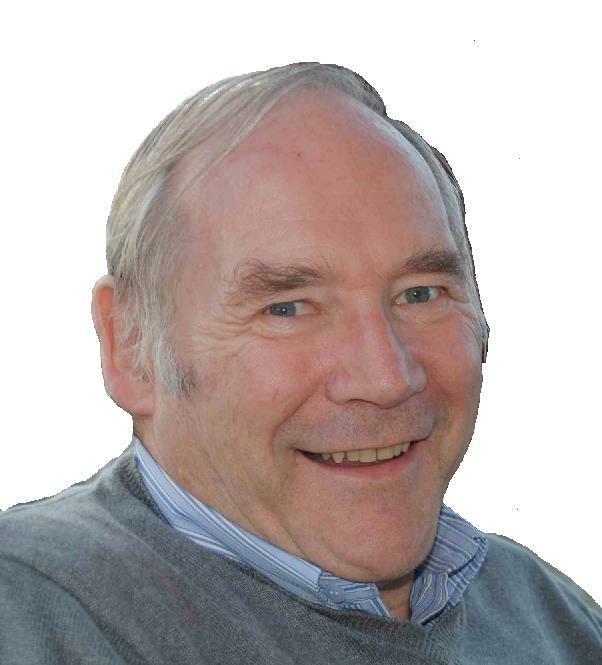 His interests include history, especially local history, reading (good books! ), photography and music. ‘Morgallion’, his first book, is a historic novel based on actual events during the Bruce Invasion of Ireland in 1315. His father’s farm on which he was born and grew up, bordered Moynagh Lough, where the remains of a crannog settlement was discovered during the 1980’s. This was subsequently subject of a comprehensive archaeological exploration under the direction of John Bradley from the National University of Ireland, Maynooth. Arthur: Firstly – thank you Stephanie for this interview. I just heard recently about the BRAG medallion award for my book ‘Morgallion’, which gives me great encouragement and means a lot to me. Writing the book was very much a labour of love, so any words of appreciation please me greatly. 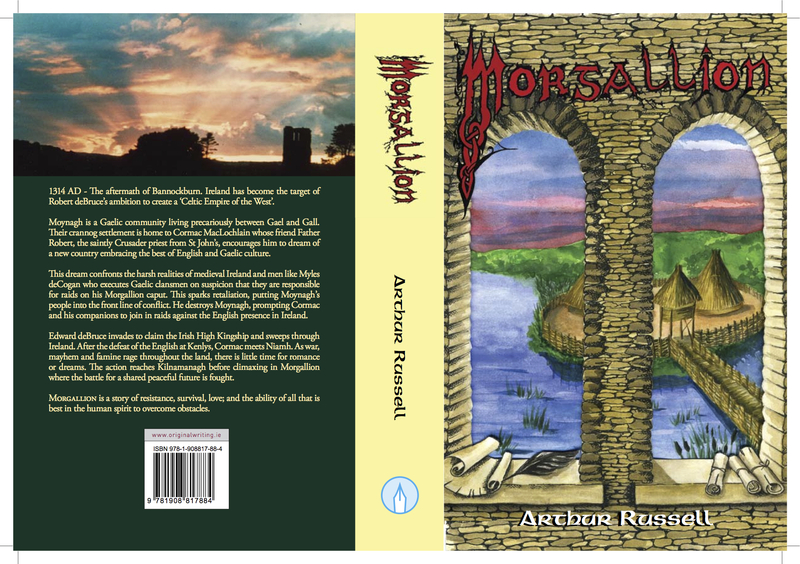 The book ‘Morgallion’ is based on how ordinary people living on the periphery of English occupied Medieval Ireland, managed to get through a troubled period of history. First they had to deal with the tension of living in the marchlands that existed between Gael and Gall (Irish and English). Then in 1314, they experienced the trauma of invasion of a Scottish army under Edward deBruce who swept through Ireland causing death and mayhem in a land also subjected to a series of disastrous harvests impacting all of Western Europe in those years. The hero is Cormac MacLochlainn, the son of the crannog community of Moynagh who, with some of his companions are moved to resist the impositions of the nearby English garrison which was under the command of the capricious and unpredictable Milo deCogan, who summarily executes Irish clansmen and destroys the crannog houses, forcing the Moynagh community to live under his watchful eye as a labour force to maintain his military fortifications. Cormac and his “Moynagh Brigade” leave Moynagh to join the Gaelic resistance to the English presence in Ireland. Here they learn the art of guerilla warfare during the months before the Scots invade. These are lessons which prove useful in the difficult days that follow, as Ireland’s communities, both Gael (Irish) and Gall (English) are impacted by the trauma and terror of war, famine and pestilence. After Edward Bruce’s victory at Kells, Cormac saves the beautiful Niamh, a chieftain’s daughter from Kilnamanagh from a terrible fate at the hands of invading soldiers but is himself seriously wounded. The Scottish soldiers want revenge and Cormac has to rely on Felim Maguire, a Prince from FirManach to prove his innocence and the guilt of the true wrong-doers. Cormac, Felim and Niamh spend an idyllic Winter in Kenlys as Cormac recovers. Their serenity is marred by the fact that both men have both fallen in love with Niamh. Cormac is painfully aware of the deep class chasm that exists between himself, his beloved and his friend. Stephanie: You write about some of the harsh realities of medieval Ireland. What were some for the challenges in doing so? Please tell me about some of the research involved as well. Stephanie: What are some of the fictional aspects to your story? And what inspired you to write about this period and conflict. Arthur: I tried to visualize and tell the story of what was happening from the side of the plain people of the time without focusing overmuch on the “great and the good” who seem to be always regarded as the history makers, and who seem to attract more than their fair share of attention from writers of both fact and fictional books. Of course you cant completely ignore the so-called “movers and shakers”; but too often the impact of their actions on ordinary people somehow gets passed over. This also poses a challenge when it comes to researching available records – for these too are largely focused on the great and the good, so it is hard to hear anything from those who simply have to endure what is being imposed on them. I believe the role of the writer of historic fiction is to “put flesh on the bones” of what is on record, thereby giving cold stark history a more human aspect; in the process making history more interesting. Personally I never want to read historical books, (or watch historic films) that bend or change history to suit a storyline It should be the other way around. When I was writing ‘Morgallion”, I tried to weave the story into the record of what is on record and what actually happened. I believe the writer owes it to the reader not to distort any known facts, just to give a story more spice, or whatever. Stephanie: What are your personal feeling towards Robert deBruce’s ambitions? Arthur: In the context of his time, moving so quickly from winning independence for Scotland (after Bannockburn), to opening a second front with a view to annex Ireland was an extremely ambitious project, which almost succeeded. It is interesting to speculate what this might have meant for the future evolution of the British Empire, which might have displayed a more Celtic character (whatever that might look like!). I rather like Bruce’s ambition; the pity was the methods chosen to fulfill them. The Bruce brothers were a product of their time, so they probably were no better or no worse than any other medieval leaders. The younger Bruce brother Edward; the man who was designated to become the next High King (Ard-Rí); had many flaws as a leader; even more as a king. His invasion of Ireland was not a campaign to “win hearts and minds”, even though in early letters written by King Robert, he placed heavy emphasis on the shared Celtic nature of Irish and Scots. This did not seem to count for much as the invasion progressed. (How often have we heard the expression of winning “hearts and minds” in recent times?). The Bruces as military leaders? a passable yes. As statesmen —–? Arthur: Pre-historic communities all over Europe sought the protection of their terrain to protect themselves and their livestock. They lived either on hills surrounded by circular ditches on which they erected easily defendable wooden palisades, or lived in low ground surrounded by water. Ireland with its many lakes provides many examples of crannogs. A crannog was generally built in relatively shallow water, on islands that could be linked to the mainland by means of an easily defendable causeway. It was often necessary to build up such islands on which a cluster of houses could be built for small communities. The community was further protected by palisades which were built around the perimeter that surrounded and enclosed the houses. Crannog living continued in Ireland until the early 17th century, and was often used by Gaelic chieftains to shelter in times of war. Crannogs had the advantage of not being vulnerable to attack from heavily armed soldiers or artillery as they were located in water-logged areas with soft underfoot conditions. With the advent of artillery, by contrast; fortresses built on heights became much more vulnerable. Stephanie: How many battle scenes are in your story and could you please tell me without giving too much away, how they were fought? Stephanie: What book project are you working on next? Arthur: At the moment I have a few book-projects in mind, some of which are at an early stage of development. One of these is a sequel to ‘Morgallion’ which follows the fate of the Moynagh community who featured in ‘Morgallion’, through the traumas of the later 13th century and beyond. This could deal with such historic events as the Black Death which ravaged all of Christendom in 1348, and the outbreak of the Hundred Years war between England and France, as well as the disputed English monarchy; both of which have echoes in Irish affairs of their day. I would also plan to weave some local stories and legends with which I am familiar, which date to that period of history. Arthur: I more than likely will, as I like the freedom of action self-publishing gives, in such issues as design etc. I would however welcome more help and support in marketing the book from the publisher. Some are better positioned and able to market more than others, so I will be looking for that next time around. The indie writer needs all the help s/he can get if they are to make any impression. I actually see this as a main challenge. Stephanie: Where do you see the self-publishing industry five to ten years from now? Arthur: If they/we (writers) can get the marketing bit right, the sky is the limit. There was great need to break the monopoly the major publishing houses had on the book market which they used so effectively to determine who would make it as a writer, and who would not. This worked particularly hard against new writers who had to face huge barriers in the publishing world, often without basic knowledge about what s/he was getting into. Mind you, many challenges still face the writer, aware or not. Self publishing calls for a high degree of self belief as well as encouragement and support. The printer publisher will have to be more than just book printers, or persuaders of authors to publish regardless of quality etc. They do writers no favours if that is the sum total of their contribution. They must make some effort to sell the books they print for writers, often at huge expense to the writers, who bears all the costs as well as the risks. All that said, I would not like to see it going back to where it was before indie publishing evolved to the point where it is today. The question now is – where does it go from here? To answer the original question more directly; indie publishing could well be the principal source of new books coming to the market in 10 years time. Meantime there is possibly need for strategic alliances to evolve to conduct campaigns to better get word out about new worthwhile authors and titles (such as indieBRAG?). Within this obviously, the role of good credible reviewers has a critical role to play in bringing indie books to the attention of potential readers. The more objective these can be, (and be seen as such); the better. Arthur: I have to say that indieBRAG discovered me, or more precisely, discovered ‘Morgallion’ in the miasma of hundreds of indie books that came out during 2012. Perhaps the fact that I opened a website www.morgallion.com may have drawn a share of positive attention to the existence of ‘Morgallion’. Whatever, I am grateful for iB’s attention and their award of the BRAG medallion. As I said earlier: as a first time book author, it means a lot to me. We are delighted that Stephanie has chosen to interview Arthur Russell, who is the author of, Morgallion one of our medallion honorees at www.bragmedallion.com . To be awarded a B.R.A.G. Medallion TM, a book must receive unanimous approval by a group of our readers. It is a daunting hurdle and it serves to reaffirm that a book such as, Morgallion merits the investment of a reader’s time and money.